Osteoporosis affects 10 million Americans, and another 44 million have osteopenia, i.e. low bone mass at levels considered a precursor to osteoporosis, according to the National Osteoporosis Foundation. An estimated one out of two women will break a bone due to osteoporosis at one point in their life. In other words, more women are affected by osteoporotic fractures than the combined number of women suffering from heart attack, stroke, and breast cancer. For men, the risk is lower, but still high – one in four men will have an osteoporotic fracture at some point in their life. Since many people over the age of 60 never fully recover from e.g. a fracture of the hip, osteoporosis is a major factor in growing disability and frailty for older people. Osteoporotic fractures of the hip, wrists, or other body parts for the most part occur after a fall. However, a hallmark of osteoporosis is vertebral compression fractures, a.k.a. fragility fractures, because they can occur spontaneously in cases of severe osteoporosis. In people with severe osteoporosis, a vertebral fragility fracture can be precipitated by as little as a sneeze or turning over in bed. A 50-year old white woman has a 16% risk of experiencing vertebral compression fractures at one point in her life, for a man, the risk is only 5%. And unfortunately, once you’ve had one vertebral fracture, you are at higher risk for getting more—both vertebral and other types of fractures (likely due to increased fall risk), according to the International Osteoporosis Foundation. While many vertebral fractures are silent, i.e. they don’t cause any overt symptoms, vertebral fractures also often are accompanied by back pain, reduced breathing capacity, an increasingly kyphotic, hunched spine (Dowager’s hump); growing disability, reduced quality of life and even increased mortality. With so many downsides, there are many good reasons to take steps to prevent osteoporotic fractures. The science of osteoporosis prevention is still in its infancy, and our understanding of the factors that affect vertebral fracture risk is changing and advancing every day. The standard way of assessing osteoporotic fracture risk is measuring bone mineral density (BMD) with the DEXA scan. However, researchers are increasingly pointing to limitations in this assessment, pointing out that BMD is only a very general gauge of fracture risk. BMD measures can provide a statistical prediction of fracture risk in a group of people with comparable bone mineral density. However, in a group of women who have the same BMD, some will experience a fracture, but most will not. In other words, BMD is a very general measure of fracture risk, it cannot identify who will actually have a fracture, according to researchers. This in turn means that there are many other factors that come into play when it comes to gauging osteoporotic fracture risk. 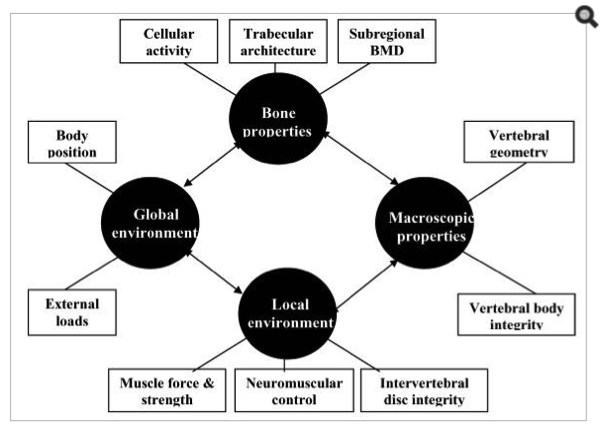 Unfortunately, because BMD measurements is the standard for measuring osteoporosis, the focus in osteoporotic fracture prevention has become on improving bone mineral density. However, basing preventive efforts on only one parameter with limited predictive value, while ignoring other important factors, is doing people with osteoporosis a disservice, some researchers argue. Most osteoporotic fractures occur after a fall, and increasingly researchers are pointing to the need for focusing on factors that reduce fall risk in preventing osteoporotic fractures. Vertebral fragility fractures, however, can occur spontaneously during simple activities of daily living. For millions of women with osteoporosis of the spine, this is a haunting prospect. The more you understand the other factors that affect fracture risk, the more you will be able to take more effective steps in preventing fractures. Here are 5 factors other than bone mineral density that affect vertebral fracture risk, and some take-away lessons on preventive steps to counteract them. The etiology of vertebral fractures is complex, and numerous other factors impact fracture risk. Australian researchers Andrew Briggs and colleagues point to a multi-systems model, outlined in the drawing below. Simply put, vertebral fractures occur when the spine is unable to withstand the load put upon it. This is affected by bone strength, but it is also affected by the state of the muscles and connective tissue attachments, the condition of the intervertebral discs, as well as the positioning and movement of the body in space, i.e. your posture during sitting and walking. In the following, we will take a closer look some of the key factors in this model.